These days the efficient motors have found much wide application in electric appliances including super-efficient fans, washing machines, air conditioners, etc. In fact, we at Bijli Bachao, in several of our previous articles, have also been quite informative on more motor-centric efficient technologies – such as utilization of motors to obtain sustainable and efficient output. Recently, when one of our readers inquired through our discussion forum about a super efficient fan, which was using Brushless DC motors (BLDC), permanent magnets and was claimed to be more efficient and consuming less electricity by its manufacturer. We decided why not to have a dedicated article on this topic. Based on several such requests and useful information, which we keep on getting on Bijli Bachao – thanks to our readers, we have decided to provide a good outline of the basic motor types including the BLDC motors and informing our readers how they’re different to the others. This article will provide an illustrative introduction on the working of such motors and will provide a comparison of the two important motors – the BLDC and the induction motors. But first what are motors made up of? The two parts use magnetic/electromagnetic energy to create movement/rotation just like how two magnets interact to create rotational motion (as shown in the gif below). And this is how a motor works. Winding copper/aluminium wire around a steel/iron metallic piece typically creates the electromagnets for stator. The magnet for the rotor can be permanent magnet or electromagnet depending on the type of motor. 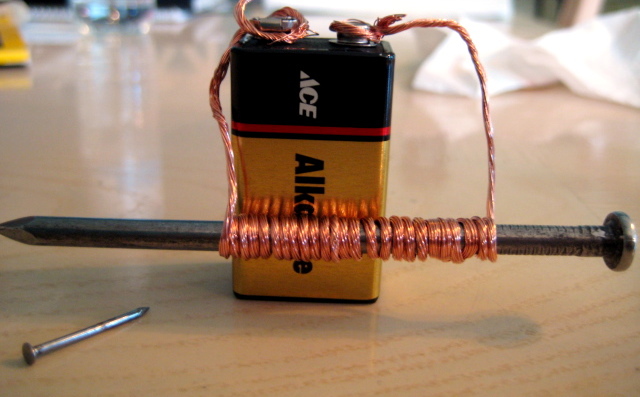 A typical Electromagnet that is created by passing current through a copper winding over a piece of metal. What is BLDC (brushless DC) motor? The main thing with a Brushless DC motor is that it has permanent magnets (instead of electromagnets) for the Rotor. A permanent magnet generates a DC (Direct Current) magnetic field instead of AC magnetic field that is produced by passing AC current through an electromagnet. This magnetic field interacts with the magnetic field of the Stator to generate motion. The current in the Stator’s electromagnet can be varied to change the speed of motion. Just because Rotor generates DC Magnetic field, even the Stator has to generate DC Magnetic Field. And this happens when the Stator coil gets DC (or Direct Current). However the current that comes through our regular electric supply is Alternating Current (or AC). That is why we need an “Inverter” and an electronic circuit that converts AC to DC of varying strength (to change the speed of the motor) to make it function properly. These BLDC motor are not just there in fans. Inverter Technology (commonly found in Air Conditioners, Refrigerators and Washing Machines) also uses BLDC motors many a times. Moreover, BLDC motors have inverter to convert DC/AC and the inverter is built-in (no external inverter is required). One of the most common questions that we keep getting on Bijli Bachao is that: “Do I need to purchase an external inverter for inverter tech AC or Refrigerator”. So our readers should not worry at all, the inverter is built-in. In order to make the operation more reliable, efficient, and less noisy these BLDC motors are the best fit. They are also lighter compared to their conventional counterparts with the same power output. Induction motors unlike BLDC motors have electromagnetic Rotor (as opposed to permanent magnets). So in this case, both the Rotor (inner movable part) and the Stator (outer part) are electromagnets. In an Induction motor, electric current produces torque (or motion) by maintaining electromagnetic induction. This electromagnetic induction is produced from the magnetic field of its winding. That’s why the name induction motor is used. Induction motors can work directly on Alternating Current (AC) and can thus work directly from the power source that we get on our electricity distribution line. The voltage on the line can be varied to get different speed from the motor (this is essentially what happens when you change the speed on your fan regulator). So it is not necessary for induction motor to have “Inverter” Control as in a BLDC motor. Can induction motor also work on Inverter Control? Yes it certainly can. And that is why not all “Inverter” ACs (or other appliances) have BLDC motor. Many manufacturers use something called as PAM (Pulse Amplitude Modulation) or PWM (Pulse Width Modulation) circuits that use “Inverter” with Induction Motors. These circuits intelligently vary the alternating current in the Induction motors to vary the speed of the motor. So essentially the “Inverter” in this case, instead of giving DC output, converts AC input to AC output, but of desired frequency. Again you do not need any external “Inverter” to make this work. BLDC motors generate much less heat as compared to Induction Motors. This results in significant efficiency improvement. Much less energy (or electricity) is lost in generating heat. That is why you find most of BLDC motors having high efficiency. Can be very easily connected to Solar Power or Battery Power. Power generated through solar is DC and that stored in the battery is also DC. BLDC motors work almost at unity power factor. Which means, if you are on a commercial or industrial connection where you are charged for Maximum Demand (MD) or penalized for bad power factor. You can save your electricity bill by moving to BLDC motors. They are more powerful, with higher speed ranges, and higher dynamic responses. These BLDC motors are therefore suitable for high speed applications (10,000 rpm or above) and are known for their excellent speed control. For bigger loads (industrial scale) an induction motor with inverter control will have better efficiency (magnetic losses increase with machine size with BLDC motors). But on an average BLDC motors have better efficiency. A non technical disadvantage in India: very few mechanics really understand BLDC motors well, so getting support can be difficult as well as costly. Inverter electronics can be complicated and difficult to maintain in varied climatic conditions in India. Induction motors are robust and can operate in any environmental conditions be it highly polluted or explosive environments. They are cheaper and nearly maintenance free in cost due to the absence of brushes, slip rings, etc. In a non inverter controlled induction motor, there are no electronics to worry about. If speed variation is not required then induction motors can give better efficiency at peak load. Less efficient as compared to BLDC motors on an average. Lower power factor and can at best give power factor of 85% (or 0.85). Motion generates heat that can reduce efficiency of the motor.